A fleet of sleek electric-powered buses — up to 24 metres long and carrying 150 passengers — would use lanes down the centre of Parramatta Road as part of a proposed $200 million public transport push to cope with the city's population explosion. The silent “track-free trams”would create new public transport between Strathfield and the city up to every two minutes with 'platforms' every 600m to 800m. The project could be delivered within five years without the need for digging up roads, acquiring properties or affecting current roads. While trackless trams are being used internationally, it would be the first system of its type in Australia. The Parramatta Road Public Transport Opportunities Study commissioned by Inner West and Canada Bay Councils and supported by all Inner West Councils endorses a Guided Electric Transit System (GETS) or trackless trams as the best option for public transport on Parramatta Road. The study considered Light Rail, dedicated Diesel Bus lanes and Track-less Trams. ability to be accommodated within the existing carriageway. 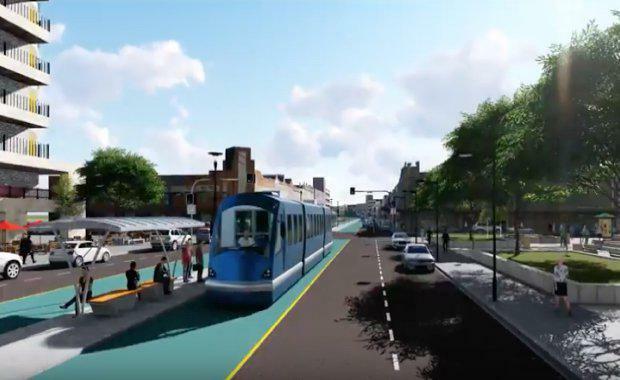 “Making Parramatta Road work is one of the toughest challenges in planning Sydney’s growth, and trackless trams should be looked at closely,” he said. “What we don’t need is another good idea gathering dust – there is a narrow window to transform Parramatta Road or it will be a basket case forever,” he said. "Track-free trams can provide all the benefit of light rail on Parramatta Road without having to dig up the road or acquire properties. After the destruction of WestConnex the people of the Inner West will welcome this creative solution. 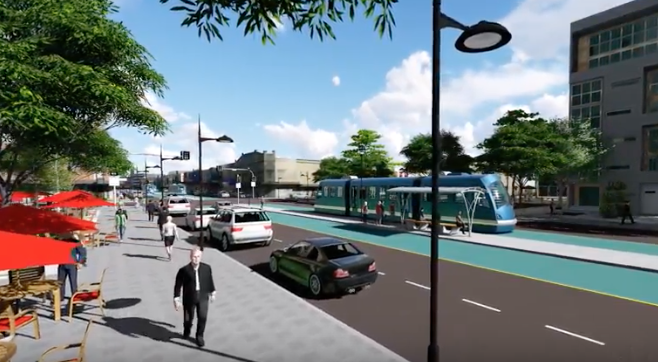 "With narrower carriages, using guided technology to run down the middle of the road instead of the edge, track-free trams can create the space for the curb side parking and footpath dining that the rejuvenation of Parramatta Road depends on. “The State Government should step up and work with councils in the corridor to take this proposal to the next level by jointing funding a feasibility study,” Mr Byrne said. City of Canada Bay Mayor Helen McCaffrey highlights that it is critical to have the best possible public transport infrastructure built in tandem with the WestConnex project. “We must make the most of the opportunities that WestConnex provides. The opportunity to really transform this area is here now - we must make the most of it,” she said. Mayor of Strathfield Council Andrew Soulos said a dedicated mass-transit line along Parramatta Road would provide welcome relief for many. “There are many possibilities for connecting to the train network and Olympic Park, preserving greenspace and easing congestion,” he said.